Welcome to Duke Field, Florida. Use our MLS listing search to search for Duke Field real estate and MLS listings. Duke Field began as one of Eglin Air Force Base's first auxiliary fields, with land-clearing beginning January 23, 1941. Duke Field's first foundations were laid February 15, 1942. The Doolittle Raiders used Field 3 as a training base later that same year. In 1949, after World War II ended, Duke Field hosted the production team for the film Twelve O'Clock High as they used the field for filming. During the Vietnam War, from August to October in 1970, Air Force ROTC facilities at Duke Field were used by the Joint Contingency Task Group to house US Army Special Forces soldiers who were taking part in Operation Ivory Coast. This was a rescue mission to bring back prisoners of war from the North Vietnam city Son Tay. Duke Field served to give the aircraft from Eglin Air Force Base and Hurlburt Field a low profile during daily training. Duke Field also served as one of the training fields of Operation Credible Sport in 1980, a second operation to attempt the rescue of American hostages from Iran. The initiative used a C-130 aircraft that had been fitted with several rocket engines for very timely takeoffs and landings; however, on October 29 of that year, during the modified C-130's demonstration for Operation Credible Sport, a malfunction and resultant hard landing destroyed the aircraft. Luckily, all crew aboard the aircraft survived. Today, Duke Field is home to the 919th Special Operations Air Force Reserve Wing, which trains at Eglin Air Force Base. The 919 SOW provides in-flight refueling for special operations helicopters and long-range infiltration missions carrying troops and supplies to support the Air Force's Special Operations Command. The 919 SOW also conducts humanitarian missions to provide medical and other forms of assistance to countries in the Western Hemisphere. 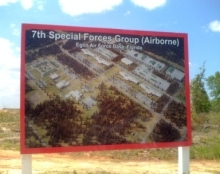 In 1994, about 300 members from the 8th Special Operations and 716th Maintenance Squadrons transferred from Hurlburt Field to Duke Field, 26 miles away, to join the 919 SOW. The squadrons had called Hurlburt Field home for 26 years. In addition to personnel, the 919 SOW received six MC-130E Combat Talons, bringing their total to 14. The merger created the only active associate unit in the Air Force.